No, not that Golden Gate, we’re talking about the Golden Gate of Kiev. Built about the same time as the Saint Sophia Cathedral, the Zoloti Vorata—golden gates—was constructed by Yaroslav the Wise between 1017 and 1024 and served as the main entrance to the walled city of Kiev. It is reportedly modeled after the Golden Gate of Constantinople. 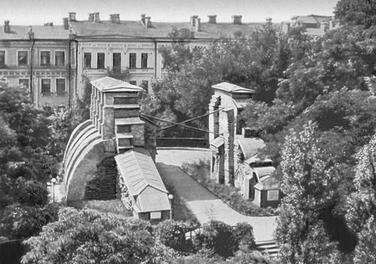 There were originally three great gates into the old city of Kiev, the Golden Gate shown above, the Polish Gate, and the Jewish Gate. The other two gates have not survived. The gate served not only as a fortification but as a statement proclaiming the grandeur of the great city within. At the time it was built, Kiev was the center of the Rus kingdom, which was a major world power in Central Europe between the 9th century until the time of the Mongol invasion in the 1230s. The gate remained an important part of the ceremonial part of the city through the 18th century but it gradually fell into decline. It was partially excavated in 1832 and conservation efforts were gradually undertaken. In 1982 the gate was completely reconstructed and restored to its original state using old paintings and descriptions in local archives to celebrate the 1500th anniversary of Kiev. Today the Golden Gate stands near a metro station and is surrounded by busy streets, beautiful parks, and open air markets. A park adjacent to the Golden Gate. During summer days and evenings this place is filled with people and vendors. When Kongo visited the gate there was a large group of Hare Krishna dancers performing and collecting money. Just like LAX or San Francisco! As amazing as the gate is…I love your photo of the park…it looks like somewhere I would like to walk.